For some time past it has been evident that additional space must be provided at Dumbarton Oaks for the exhibition of objects in the Collection, not now on display, as well as to provide suitable rooms for the use and study of a library of books on gardens (their design and ornament) and related subjects, which Mrs. Bliss has been collecting in recent years and which it is her hope eventually to convey to Dumbarton Oaks. Also, adequate space should be prepared where the collection of Byzantine coins and seals at Dumbarton Oaks can be exhibited and studied. In addition, it will be necessary to make provision for increased stack room. As momentum built for a new addition at Dumbarton Oaks, the Blisses realized that this should also include space for Robert Bliss’s collection of Pre-Columbian art, then on display at the National Gallery of Art. Somewhat surprisingly, the modernist architect Philip Johnson was approached to design the addition, which was to be located to the south of the Byzantine Collection, on 32nd Street. 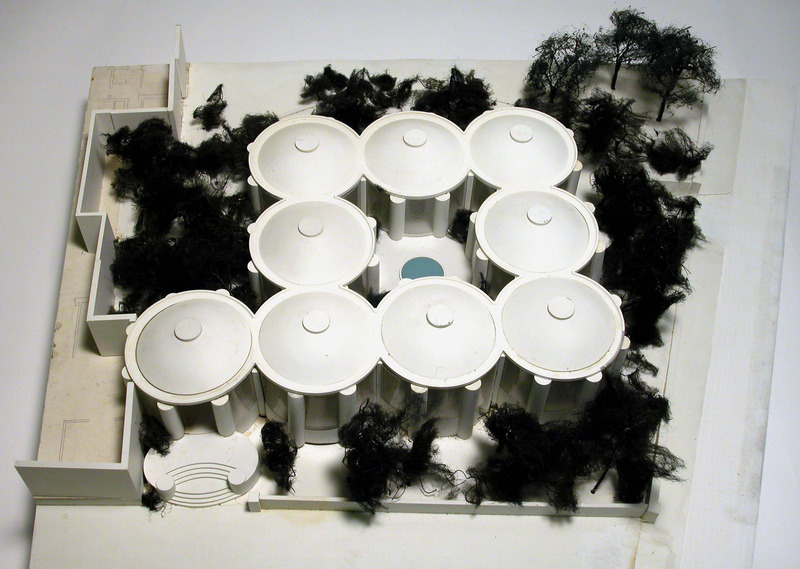 Johnson designed a pavilion consisting of eight domed glass cylinders, and his design pleased the Blisses when he submitted it and a model in 1959. However, they were hesitant to approve the design for its intended location, which was to the side of the front yard of the Dumbarton Oaks mansion. By 1960, a compromise solution was reached: the pavilion, reduced in scale, would be built in a secluded area known as the Copse to the north of the Music Room. It would house Robert Bliss’s Pre-Columbian art and library, and there would be ample room in the basement for the Byzantine coins and seals as well as a much-needed new photography lab. Moreover, the sleek modernity of the building’s design and the innovative Plexiglas stands and cases that were eventually designed for the pavilion would show off the Pre-Columbian objects as artworks. To house Mildred Bliss’s garden library, a traditional red brick building, matching in size the two existing Byzantine Collection pavilions, would be designed by the Blisses’ friend, Frederic Rhinelander King, and be built where the Johnson Pavilion had first been envisioned (see post). The Dumbarton Oaks Administrative Board and the Trustees for Harvard University were hesitant to approve the additions, however. They feared that the new buildings would divert resources from the established Byzantine Studies program. They wanted strict assurances that the existing focus on Byzantine studies would not be diminished in any way. In response to these fears, the Blisses arranged to contribute additional funds to the endowment to cover the maintenance of the new Pre-Columbian and garden library wings. Nor was this the last hurdle to be cleared. New construction in Georgetown needed the approval of the D.C. Commission of Fine Arts, tasked with preserving the “Old Georgetown” atmosphere that characterized the Historic District. At first, the commission seemed a possible threat to the erection of Johnson’s modern structure. Ultimately, the commission granted their permission to begin construction with the understanding that a brick wall and evergreen plantings would hide the pavilion from street view. All of the obstacles now removed, building finally commenced uninhibited. 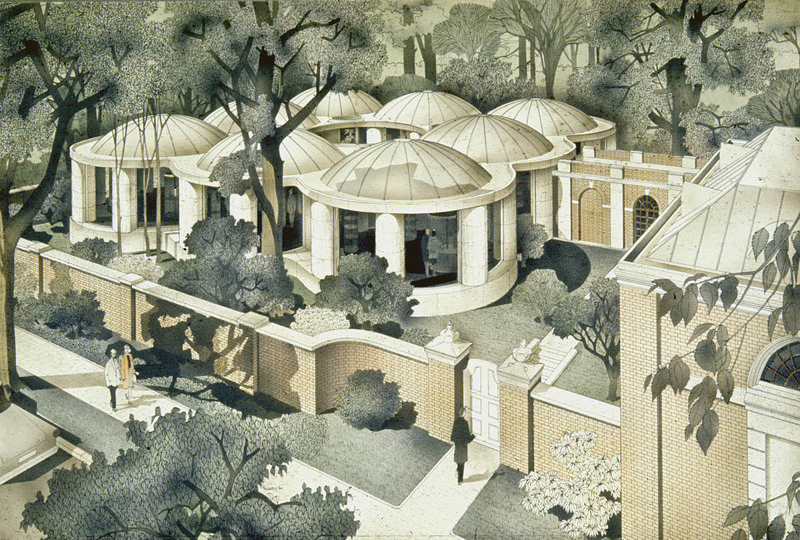 Unfortunately, Robert Woods Bliss would not live to see the Philip Johnson Pavilion completed or his collection exhibited at Dumbarton Oaks. He died just a year before the Robert Woods Bliss Collection of Pre-Columbian Art was opened on December 10, 1963, to critical and public acclaim. In his foreword to a new Handbook of the Pre-Columbian Collection, director John Thacher remarked, “The Robert Woods Bliss Collection of Pre-Columbian Art was formed by the strong personal interest of a man deeply engaged in his subject.” After decades of collecting and years of planning for the art to be exhibited, Bliss’s desire that the public learn of the artistic splendor of ancient America has been realized. 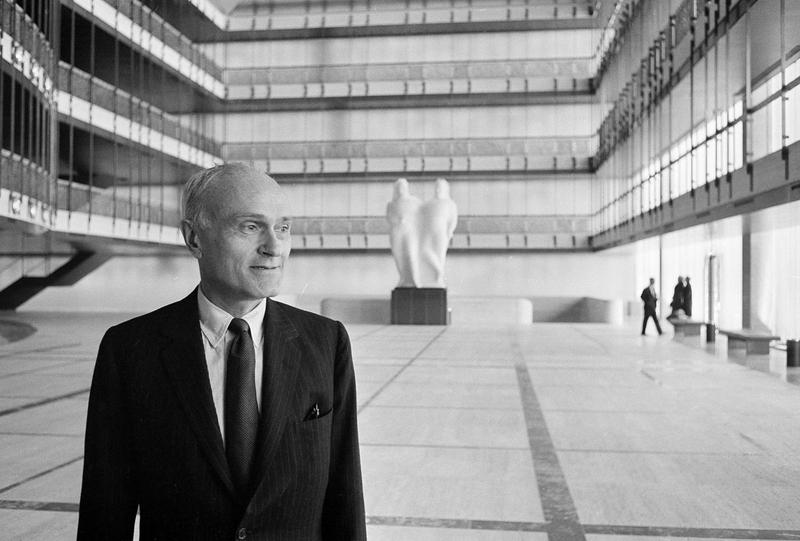 Read more about Philip Johnson and the Dumbarton Oaks Pre-Columbian Pavilion.